Now the Defense Department has announced that it will deploy F-22’s to “Europe” according to Air Force Secretary Deborah James. The actual location of the deployment, the number of airplanes, and the precise mission were not disclosed by the Air Force Secretary nor by the Air Force leadership. But the most likely location is Poland, where the US previously deployed F-16 fighter jets. 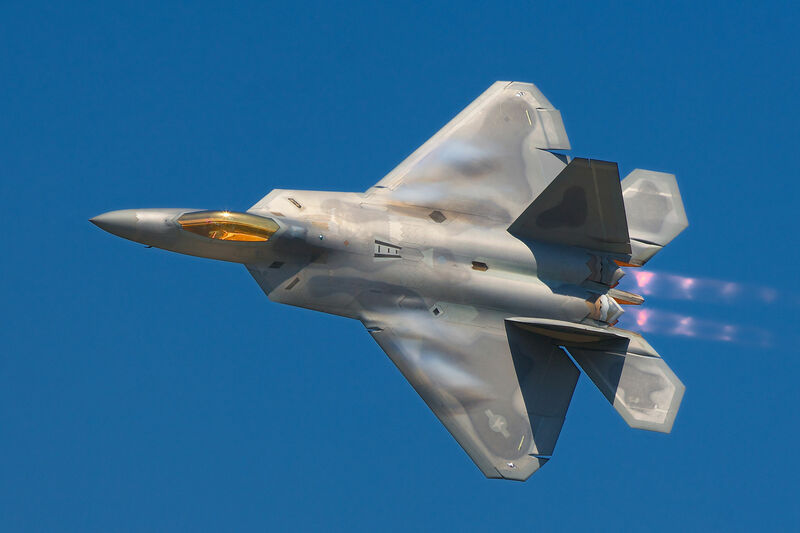 The F-22 is the first 5th generation stealth aircraft in the US inventory, and until the Russian FA PAK T-50 actually enters service, it is the most advanced aircraft in the world. There are many reasons to favor the deployment, but also areas of serious concern. In favor of moving US aircraft to the area is to revitalize the US commitment particularly to the newer NATO member states including Poland, Latvia, Lithuania and Estonia. all of whom are under heavy Russian pressure. The deployment also will be an object lesson to the Russians who have been flying mostly older aircraft around the periphery of these countries as well as other NATO members including the UK and Norway, and non-NATO players, especially Sweden and Finland. While there is little that concretely suggests the Russians are interested in anything more than intimidation, and probably lack the military ability to follow up in any concrete way as it would start a war that will be interpreted by NATO as sufficient to mobilize all its forces, nonetheless if incursions are left unchallenged it will temp Moscow’s “ultras” in the military to put even more military pressure on the Baltic countries. Showing off the F-22 is also a good idea, although it will give the Russians a prime opportunity to test the F-22’s capabilities and look for operational vulnerabilities. It would seem this is a risk worth taking, since it will also have a reverse effect: it will make Russia’s Air Force generals much more circumspect when they set out on their next intimidation mission. It may well end up they are chased away and before they get too close to any shoreline. The serious concern remains NATO itself. The US deployment comes after NATO cut its patrols in half and seems to have been in a mood to let the Russians have their way. Thus the American deployment of F-22’s is as much a way to revitalize a flagging NATO as it is to challenge the Russians. NATO is weak and getting weaker, just as the US military is losing its punch with heavy troop reductions and not many new weapons programs. The F-22 is a good wake up call all around. Beyond that, there is a strong case to be made, as we have said before, in a new upgraded production of F-22 aircraft. The fact of the matter is there is almost universal skepticism among experts about the combat usefulness of the F-35 semi-stealth, which is the only new fighter the US has after F-22 production was prematurely cancelled. The difference between the two airplanes is profound: the F-22 is a strategic aircraft; at best the F-35 is a tactical airplane that has issues and vulnerabilities against the latest Russian planes such as the SU-35. Overall the US effort to checkmate the Russians needs upgrading and much more serious policy attention than it is getting. Buzzing coastlines with bombers equipped with nuclear-tipped cruise missiles is a dangerous and reckless gambit by the Russians and, in any case, we should not tolerate it. The Russians have been simulating cruise missile launches from Bear bombers off the coast of Canada and across the continent in the area of Alaska all the way down to California. The administration has been silent and has not really done much to complain about these “exercises.” This is a policy error: you don’t let the other guy fly around your coastline with nuclear bombs and act like everything is normal. While thinking about the Baltics and Europe, the administration also needs to get its act together in protecting the United States.